Using Map 78, I found my way to the entrance of the Galty Waterworks and parked at R91547 28065 C at a line of boulders at the entrance. Going through the boulders I followed the much overgrown remains of an access road south. It became necessary to walk atop the grassy ridge next to the road/track in places, as prickly thorn bushes crowded in to block progress. Passing through the worst of this, I followed the track to a gate at R91483 27393 D. By now views had opened up of the valley and mountains ahead, with Cush to the right, and Galtybeg in the distance. After passing through the gate onto open bog Knockastakeen looms on the left. The forestry that had been present ceased after the gate. 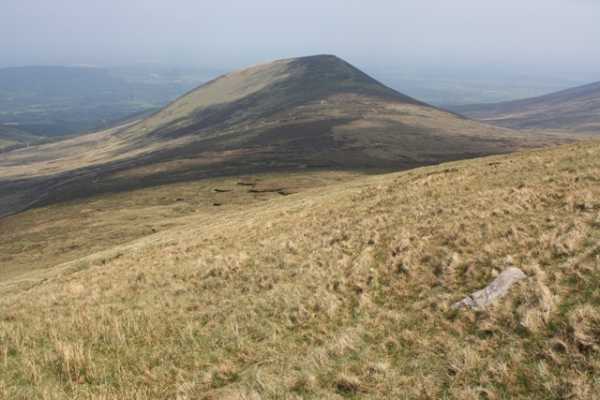 I turned left uphill and handrailed the forest which brought me over the northern tip of the Knockastakeen ridge. After about 400 metres I turned right and followed the ridge south. 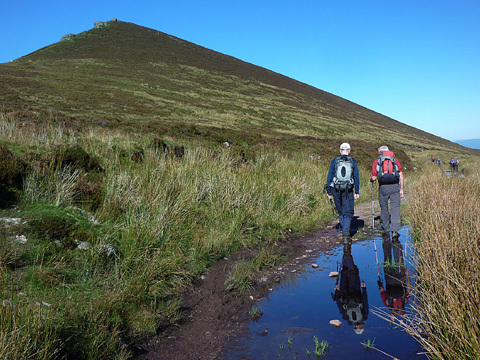 About 1.5 kms brought me to the summit of Knockastakeen at R91517 25824 E. Amazing views were had of Galtymore, Galtybeg, Lough Muskry and its backdrop of cliffs leading up to Greenane ahead. 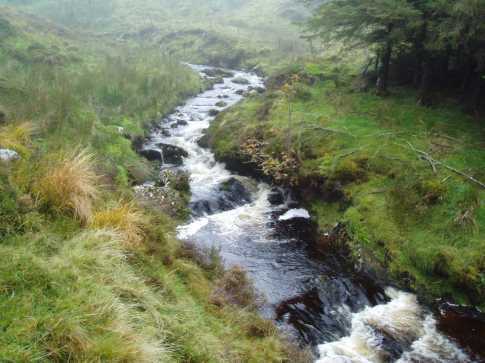 Cush sits just across the narrow valley to the right and sat high and proud over the forestry on its lower slopes. 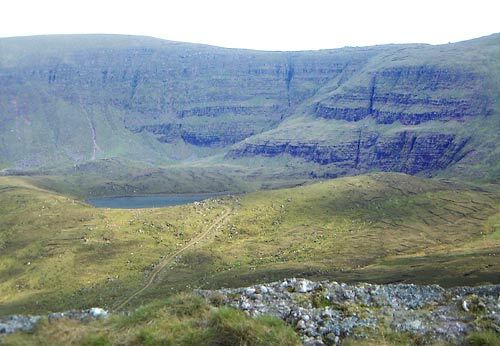 From the summit there is a clear view of Lough Muskry. This nestles under Greenane.